Very well specified Riviera 43 and the best value in Australia! SHOWDOWN was delivered new in 1999 and built to survey specification. She spent the early years of her life in Queensland as a chartered game fishing vessel, whilst being maintained to the highest standards. She has now been in the hands of the current owner for over 5 years who has continued the high maintenance regime. Both Volvo Penta TAMD122P engines were rebuilt in 2010 and have done approximately 1000 hours since. The vessel's interior fit out is supreme and presents well. It is represents the condition you would expect of a much newer vessel whilst retaining the classic Riviera Platinum layout and decor. There is a reason the 43 is such a popular family vessel, and that is the addition of the 3rd cabin. You will be able to comfortably sleep 7 people in dedicated bunks, plus utilise the generously sized saloon. The forward cabin has the option of 3 singles or one large double with a single bunk overhead. The master cabin to starboard has bathroom access and the port cabin has the addition of a washbasin and second Vacuflush toilet. The well-appointed galley includes an updated Vitrifrigo upright fridge/freezer and plenty of storage space. The aft cockpit of the Riv 43 is the place to entertain, with substantial room for all your guests. Drown out the neighbour's voices with a recently upgraded set of JL Audio speakers. 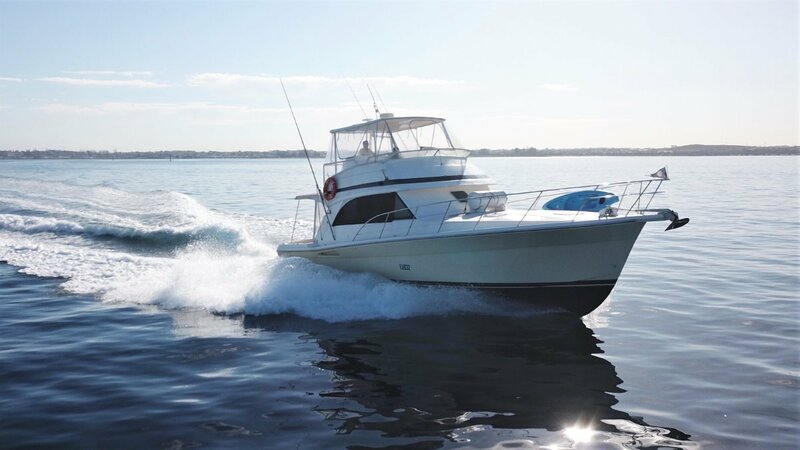 The flybridge is spacious and able to seat 8 people, keeping the skipper in the mix whilst underway. accomodationMaster suite to Starboard, Guest cabin to port with 2 single bunks, forward V berth with 3 singles or 1 double and 1 single.